Filmmaking Labs and Workshops at Festival 2019! Cost: $65 includes supplies, brown bag lunch plus 2 passes to see a film at the 10th Annual Providence Children’s Film Festival! 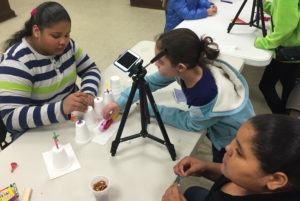 The PCFF Give Me 5 Youth Film Lab challenges Rhode Island youth to work collaboratively to complete a one-minute film, in only 5 hours! 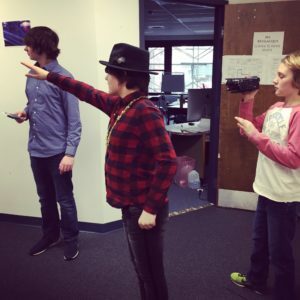 Assigned teams guided by a film coach will make a film from beginning to end: brainstorming, writing, storyboarding, acting, filming, and editing. At the end of the lab, parents are invited to watch the finished films and hear the teams discuss the process. Registration details here. COST: The Washington Park Library drop-in workshop is admission-free. Tickets not available online. Register by contacting Amy Rosa (arosa@provcomlib.org, 401-781-3136) at the library Mon-Fri from 1:00-5:30pm. Bring your characters and their stories to life through animation! This short workshop gives kids an opportunity to create and learn about animation using storyboards to plan it and easy stop motion techniques to film it! Presented in partnership with Rhode Island Museum of Science and Art (RIMOSA). PLUS! The RIMOSA Animation Station will arrive by January 9 and will be at the WPL site until Feb. 20th. Animation Station is a one stop shop for creating animations. Using an iPad, and an app named “stop motion,” users can take a series of still images that are strung together to create animated movies. 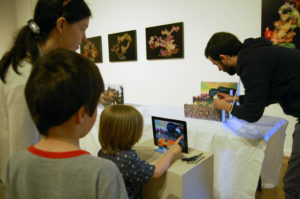 The iPad is attached to an arm that allows you to shoot downward and use the exhibit’s table as a backdrop, or to shoot horizontally for a more three dimensional look — all while seeing your creation come to life on a large overhead monitor. COST: The Wanskuck Library drop-in workshop is admission-free. Tickets not available online. Register by contacting Molly Osborne (mosborne@provcomlib.org, 401-274-4145 ext. 4702) at the library Mon-Fri from 1:00-5:30pm. Become a Human Puppet! Pixilation (from pixilated) is a stop motion technique where live actors are used as a frame-by-frame subject in an animated film, by repeatedly posing while one or more frame is taken and changing pose slightly before the next frame or frames. The actor becomes a kind of living stop motion puppet. Presented in partnership with Rhode Island Museum of Science and Art (RIMOSA).